UPDATED on 7 July with public transport information – see end of post. It’s almost that time again! 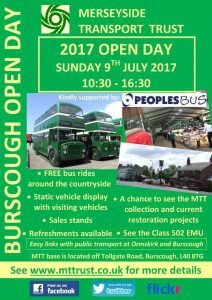 On Sunday 9th July 2017 the Merseyside Transport Trust will be throwing open their doors to the public. Come and see us – the event is open from 10:30am to 4.30pm on 9th July, and admission is free. As always, the 502 will be open for you to inspect the progress we have made over the past year, and members of the Friends of the 502 Group will be on hand to answer all your questions (and accept your donations). The usual collection of heritage vehicles will be on display, with visiting vehicles from all over the country. There will also be sales stands where you can pick up a bargain. Bus links will operate from Ormskirk and Burscough Bridge stations to connect with rail services. 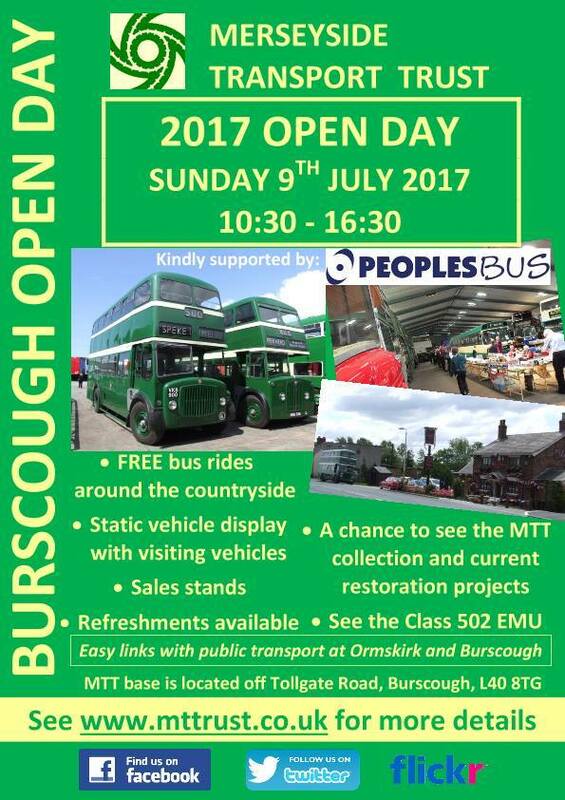 If coming by car, the MTT is located just off Tollgate Road, Burscough, L40 8TG. UPDATE: Bus times for the free bus link, operated by the Merseyside Transport Trust. 1020, 1050, 1120, 1150, 1220, 1250, 1320, 1350, 1420, 1450, 1520, 1550, 1620. 1033, 1133, 1213, 1313, 1413, 1513, 1613. Please note that due to industrial action on Northern Rail, there will be no trains to Burscough Bridge on Sunday. An alternative, for people travelling from Wigan or Southport directions is Arriva bus service 375 which calls at Ormskirk bus station. Merseyrail is not affected by strike action on Sunday and trains from Liverpool to Ormskirk will run as normal.